« Why Ecoroofs Are So Cool! Tamzin Ractliffe is a powerhouse of innovative solutions on the social investing scene. Her work creating a social investment exchange with SASIX, G6 and NeXii is changing how social projects are funded and implemented in South Africa and around the world. For Tamzin it’s not operating as “non-profit” organizations anymore, it’s about working as social-profits. Tamzin, Skyping in from South Africa, explains the concept behind social profits, speaks to the new frontier of social investment and tells us why charity and poverty are not inextricably linked. Come and learn from Tamzin live at Springboard Innovation‘s Revisioning Value (ReVV 2010) Conference on April 26th, 2010in Portland, Oregon! SE: Can you give us some background on social investing and what got you interested in this field? TR: My background is actually from the financial market side. I worked initially as an analyst for an asset management company that was linked to the JSE (Johannesburg Stock Exchange). I then subsequently moved to the UK and worked in venture capital and biotechnology. In the middle of that process, I went back and did a degree in psychology and started working in social development. I’d often wondered how I could match those. Biotechnology was, for me, one component of matching financial services and innovative healthcare—but then post-1994 in South Africa, with the new change in government and move to democracy, there was a very strong new program to try and address the inequalities of apartheid. So what we term in South Africa as social investment, Americans would term corporate philanthropy. It became quite common for businesses in South Africa and yet there was no awareness about how to do that and who was working in the social development space. When I came back to South Africa in 1997, after being in the UK, I started looking at how to use the financial services infrastructure, intermediaries and investment model for social development. I started asking whether there was a way the intermediary could be the intersect. Since 1997, I’ve been working around the sorts of systems to use, how do you do due diligence from a social development point of view and how do you start talking about social profit as opposed to non-profit? I don’t know how much you know about South Africa under apartheid, but there used to be signs everywhere that read “whites only” or “no non-whites.” There was a deep set distinction that you were either white or you were non-white. I remember having a geography teacher in school that said to me that there was, “no such thing as a non-person” and that we should never refer to anyone as a non-white. And I remember thinking about this when it came to non-profits. There’s no such thing as a non-profit actually. You might not make a financial profit, but you are there for a purpose and that purpose is some kind of social profit. When we started Greater Good and SASIX, we were discussing what social profit is. And the minute you start looking at it through that lens, you are calling on non-profits and not-for-gain organizations to demonstrate their value. It might not be for financial profit, but it also shouldn’t be for financial loss and it should definitely be for some kind of social benefit. SE: Can you explain the system behind a social investment exchange market rather than a monetarily driven stock exchange market? TR: Well it’s still an exchange of one investment for another, specifically around a donor’s financial investment for the beneficiary organization’s social profit. So your financial investment comes up with a social profit. That’s why we call it a social investment exchange rather than a social stock exchange. That’s important because many people have used the term “social stock exchange” erroneously with the effect of people becoming confused. A social investment exchange is not a stock exchange. However, I do believe that a social stock exchange is possible and we’re actually looking at making an extension of our investment exchange into a stock exchange. It would be a true social stock exchange in the sense that you would have paper and stocks issued to you, which you could trade on a regulated market. For us there is quite a stock continuum which goes from something that today might get Grameen finance, tomorrow might have grown to give debt finance, which has then started to get an investment exchange, but then could subsequently list on a stock exchange and become an equity—a social equity, but an equity nevertheless. One of the things we’re busy doing is a feasibility study around the progression of SASIX into an investment exchange and a relationship with the Johannesburg Stock Exchange, or others, to create a social stock exchange. The only social stock exchange initiatives at the moment are in London, Italy and Singapore. Those are the only three, other than ours here in South Africa, that we know of starting to gather around the idea of a proper stock, or true stock exchange. So we’re quite careful not to talk about investment exchanges as though they are stock exchanges. SE: What is the process that a project would go through to be listed on the SASIX Social Investment Exchange? TR: Coming out of a strong venture capital background, I started looking at how we could create the kind of proper due diligence around an organization even though they weren’t delivering a financial return. How could we equate that due diligence into what they were doing on a social level? Our basic proposal looks at the aspects of organizational capability and capacity to deliver that program. What is the management like? What are the systems like? What is the sustainability like? All of those things you would look at if you were making any other investment for profit. Then we look specifically at the social impact side. What is the depth? What is the breadth? What is the urgency of the issue they’re addressing? How far do they reach and how critical is the area that they’re going in to? Then of course we have to consider and compare regions. In South Africa we work within a specific poverty nodes. There are about 20 nodes in the country that are identified as very high poverty regions. It’s much more expensive to work in these areas. And when the cost of a life change in those areas is significantly harder to achieve than in the typical urban area. However, the urgency and potential impact of that life-change in terms of a community can be so much bigger. We look at all those different things and come out at the end with three answers: What the investment is, what the risk of the investment is and what the potential impact of the investment is. After going through that process, if the project gets through our understanding—and at SASIX our reputation is strongly linked to our projects—we will then list it as an organization. Once it’s been funded through our online funding process, we make payments and they implement the project. But we continue to monitor their progress throughout the project. An investor will be able to understand where we are in the fundraising process, where they are in the implementation process and they get a report on what was achieved and the extent of the life-change. From the financial side, a lot of people don’t understand that SASIX is not only for grant finance, but also has a lot of pension assets under management—probably about $250 million. Now those are for-profit investments, but in community based social initiatives. So it’s exactly the same process but there we’re not only looking for the social impact, we also want the financial return as well. We have the same kind of monitoring, but it’s obviously a great deal more stringent process, because it’s pension fund money. SE: How has this shift affected fundraising and social investing—it’s quite a bit different than the typical process of a charity event or drive. How are you seeing the world change because of these new development tools that we have? TR: It’s interesting that you ask that question, because we’ve just been having an argument about whether charity is dead, per se, and whether this whole notion of high performance social investment and financial return on those investments are the way forward. I’m quite fiercely of the notion that the full continuum needs to reign and that there will always be a place for charity. That’s not to say the poor will always be with us. I don’t believe that is necessary. I just don’t see charity and poverty as being inextricably linked. At the moment, in many people’s minds, charity and poverty are inextricably linked. But for me charity can become something that is more about providing for typically unavoidable situations that happen—such as for the elderly and the disabled. For people who need respite and care and a place of safety within a world that often doesn’t have that. Poverty is something we can overcome if we put our mind to it. This whole idea that it will always be with us is very much like the “work is love made visible” as a rationale for the workaholic. My father always said that and it’s stuck with me. This move to social investing is starting to make people more thoughtful. It’s also demanding that social profit organizations be more accountable. Something we’ve found is that a lot of organizations had this “we do good work, therefore you should support us” mentality. They aren’t necessarily being transparent about what their doing, they just expect you to take that at face value. This move is forcing them to realize that they’re actually in the business of welfare or social development. Business is not always a great word to use—it’s often seen as a dirty word in a professional stance on both sides. Demanding accountability for performance in the social sector is changing the entire game. And I think the non-profits that don’t adapt to that are going to find it difficult to continue. SE: You mentioned that you don’t believe that charity is inextricably linked to poverty. What’s the big picture for you? TR: I remember being at a conference last year with somebody who said that if the top five percent of the global population, ranked according to wealth, gave away just one percent of their wealth, it would increase the wealth of the bottom 25 percent at least 400 times. There’s something quite fascinating about a world that believes this level of inequality wealth distribution is OK. One of the things that I would look at is the idea of ongoing growth, even in developed countries. Americans, at least at the moment, are seeing a slowdown of growth of companies and therefore a slowdown in the growth of their income and lifestyle. But future growth is possible, I think, in the poor markets. What it requires is some kind of realignment of assets and resources of financial flows. So fishing in Vancouver Bay may be totally depleted because it’s been fished out, but Ivory Coast may have a more sustainable situation available. That automatically creates some kind of new equilibrium in terms of redistribution of wealth. In post-Apartheid South Africa we have an program called Black Economic Empowerment which says that every company should have a program that looks at promoting the redistribution of wealth and empowering the black community—whether it’s a grassroots initiative or one that supports previously disadvantaged citizens. That’s what we’re trying to do here. To say that there are so many markets in countries of the poor and so much potential in those markets. There’s no access or information in the markets with the money on how to actually create that. One of the things we want to do through NeXii and G6 is to identify that access to new markets, to developing markets and those which have a sustainable impact on poverty. To the extent that there will be a “lessening of lifestyle” for the wealthy is not quite accurate. But the two need to move closer together. If one has to stay where it is while the other lifts up, then so be it. For me that’s the objective of all this. 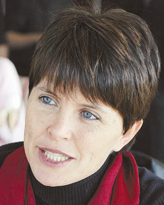 Tamzin Ractliffe is the founder and CEO of SASIX, a social investment exchange in South Africa, and Greater Good, the organizational vehicle for SASIX grant funding and social programs. She’s also a speaker at the ReVV 2010 Conference in Portland, Oregon. You can learn more about Tamzin and her ground-breaking work at: http://www.sasix.co.za/ and http://www.myggsa.co.za/about_us/. The ReVV 2010 Conference takes place on April 26-27, 2010 in Portland, Oregon at The Gerding Theater at The Armory. ReVV 2010 is a two-day conference geared towards educating citizens on social change and investment, and also including the community in finding solutions. The April 26th (Monday) agenda is a full-day schedule of educational sessions with leading social investment experts. Tuesday focuses on putting that knowledge into action through workshops, and discussing and brainstorming solutions for local, national and international issues. Tickets can be purchased for both days (best deal) for $349.00. Conference Only (April 26th | The Gerding Theater) is $239. Click here to register now and to view additional registration options. This entry was posted on February 12, 2010 at 6:45 am and is filed under Uncategorized. You can follow any responses to this entry through the RSS 2.0 feed. You can leave a response, or trackback from your own site. hey that is a really nice post. can you please let me know the ideal business location to start investing in UK. The only states thus far which authorize L3C LlCies are Vermont, Michigan and Maryland. Legislation is pending in other states. The company will be named: “Social Benefit Investment Exchange of America, L3C LLC” and be incorporated in Vermont, then qualified to do business in all 50 states, DC and the territories and possessions of USA. I have plenty of research notes on the major subjects and know the exchange is feasible and will make some profit. I have sent an RFP to AskSAM to propose the software to run the entire IT. The system will be paperless, virtual and reside on an Apache server running Linux and be hosted by a very competent ISP with a very secure system with instant off-site backup (RAID 5). 1. How to detect and prevent scam artists. This includes organizations parading as social benefit NPOs only to scam money from the public. Most NPO’s really are only money raisers for their principal managers. I refer to the American Red (double) Cross as an example. The proposed SBIE will have an Ombudsman whose job it is to perform initial and periodic due diligence investigations. 2. Investors will be screened and their motivation toward social benefit investment examined. 3. SBEE’s will be delisted if they violation the Code of Honor or do not perform, well enough, the quad bottom lines: People, Planet, Profit and Principles. 4. Our Chapters in each state will nominate a panel of experts who are licensed in that state, who are willing to provide service for low fees to SBEE’s on how to sell investments. 5. The exchange will provide liquidity for all types of assets and promote barter. The intent is to allow several SBEE’s to swap goods and services, not just share and cash. 6. I’m designing the software with several models in mind: Mondragon’s Caja Laboral credit union, KIVA, Garmeen Bank, eBay and several barter sofware providers. I’m using mind mapping for over-all project conceptualization and management. I have a paper I did on South Africa, “World Plan for the Garden of Eatn’.” It’s on the website or shortly will be if not there yet. I’d like to download your talk/presentation at Portland tomorrow or listen in live. My phone number is 270-307-4857 and email is: jimmiller5417@yahoo.com.